PPCGeeks.com – [How To] Explode Your Brain! [How To] Explode Your Brain! When someone turns to me and tells me they have a splitting headache, I normally kindly say “I’m sorry about that” and continue with what I was doing previously. It’s not that I don’t sympathize with this person, but I can’t empathize. I don’t ever get headaches. I don’t know what they feel like. All of this was true before until a few days ago. 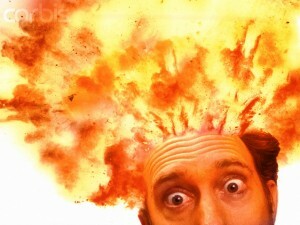 I was casually browsing the forums and opened a thread comparing the Evo3D with the Galaxy S2. Well that was good and all, after all the SGS2 is an amazing device with incredible specs, and although I personally would prefer the Sensation because of the superior resolution and the GPU being able to process more than one texture compression format thus eliminating the need to root my phone and install workaround drivers from Chainfire, it still packs a mean punch and thus far has outbenched its snapdragon/adreno220 nemesis in almost every test they can dream up. So It’s a worthy argument. Then the subject of 3D came up. This was the beginning of the end for my precious brain. So of course it went back and forth, but soon the thread turned into an all out street fighting brawl between gTen and BlackDynamite. From there it was an epic battle of galactic proportion with each warrior using all the tricks in the book, from massive multi-quotes per thread to classic semantic and argument techniques. With each passing post I felt my cranium throbbing more and more, but could not turn my eyes away from the madness. Pretty soon I heard an unsavory pop and knew that my brain had indeed exploded. The battle yet continues, although I’m not sure for how much longer. I’ll say this though, next time someone tells me they have a splitting headache, I’ll think back on this thread and truly be able to empathize with them and perhaps offer them an Advil. If you too care to view the chronicles of this epic battle, or if you are just plain masochistic, then take a look at the thread HERE and when the 3D talks start you’ll know you’re in for a world of pain.